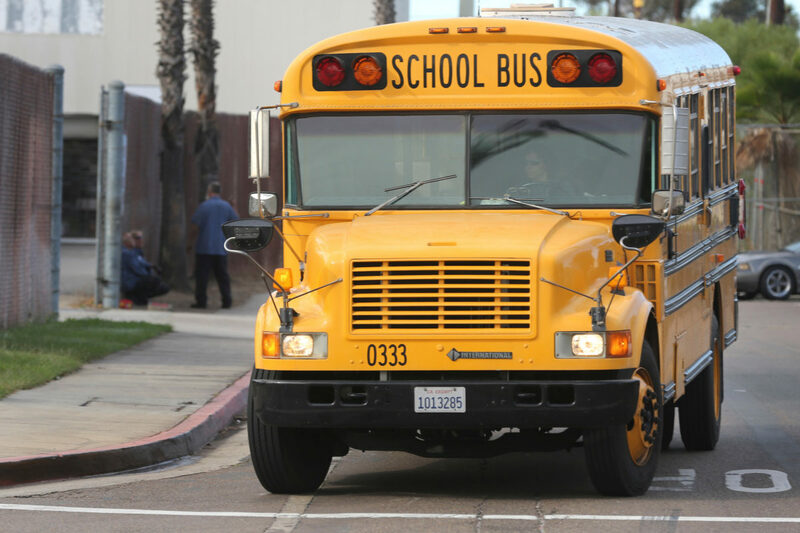 California is one of a dozen states that allows school districts to charge parents fees for bus rides to school. Records obtained by Voice of San Diego show that in the 2014-2015 school year alone, the district referred 380 parents to a collections agency for debts that ranged from $10 to $500. This post has been updated from its original text. Records obtained by Voice of San Diego show that in the 2014-2015 school year alone, the district referred 380 parents to a collections agency for debts that ranged from $10 to $500. From 2011 to date, the district has paid Transworld Systems Inc., a Delaware-based collections agency, $31,230 to recoup outstanding bus fees. Transworld helped the district recoup some but not all of the outstanding fees. In 2014-2015, outstanding fees for accounts referred to collections totaled $166,860. With Transworld’s help, the district recouped $26,108 – roughly 15 percent of that year’s total. San Diego Unified refers parents to collections in July if they haven’t made good on outstanding bus fees from the previous school year. Collections agents can then send parents letters, call them on the phone or threaten legal action should accounts go unpaid. Having accounts sent to collections can negatively impact parents’ credit scores, making it harder to secure loans or escape poverty. Gene Robinson, the district’s director of transportation services, wrote in an email that the district doesn’t kick children off buses mid-year if parents fall behind in their payments, and can allow parents to arrange payment plans. Sometimes, however, families whose accounts are turned over to collections become ineligible for transportation services the following year – until fees are paid to date, Robinson wrote. A San Diego Unified spokesperson said in a statement that the district is trying to be a responsible steward of public money by contracting with a collections agency to seek overdue transportation fees. But Derek Finley, a parent whose son rode the bus to Mission Bay High, said he didn’t realize he had agreed to fees when he signed his son up for the bus. “Honestly I had no idea it was costing money. I mean, it’s a school bus. I just assumed it was free,” he said. Finley said around 2011, he separated from his wife and was forced to sell his house at a loss to keep the bank from foreclosing on it. As a single dad, he struggled to pay bills and his son qualified for subsidized lunch. For that, Finley assumed the bill the school district sent him was a mistake – until he started getting calls from collections agents. Today, Finley’s son is graduated and the family’s finances have improved. But he still has the debt for bus fees hanging over his head. “My credit is already shot, and this debt is a looming cloud above me. I actually considered bankruptcy to scrape it off, but I’ve resigned myself to tough it out and repair my credit,” he said. Sopheap Cheam, whose daughters rode the bus to a school in Mira Mesa, believes his account was mistakenly sent to collections. He said he never received any bills from the school district informing him he was past due. When he got a call from a collections agent recently, he just assumed they had the wrong person. Dan Domenech, executive director of the American Association of School Administrators, said the vast majority of school districts in America offer free transportation as a service that students are entitled to. But starting around 2008, more states starting requiring fees for transportation to compensate for new financial pressures caused by the recession. “We find that unfortunate, because school districts have the responsibility to provide a free education, and part of that includes getting a kid to school,” Domenech said. California is one of 12 states that allow, but don’t require, school districts to charge parents fees for transportation. Costs vary by school district. Oceanside Unified charges $360 per student. Families in Grossmont Union High School District pay $325 per student. Poway Unified charges $575 per student. Domenech said this is the first he’s heard of school districts turning to collections agencies to recoup the fees. “That’s a little unusual and goes above and beyond what I’ve seen before. It’s a shame,” Domenech said. The authority for school districts to charge for bus fees dates back to a 1992 California Supreme Court case in which the justices ruled that transportation is not an essential element of school activity and thus not something school districts must provide for free. State law requires that school boards waive transportation fees for students with disabilities or those with “indigent” parents or guardians. The state Board of Education has said it “strongly recommends” school districts offer free transportation to students who qualify for free meals. The district provides free transportation for students with disabilities, and exempts students who qualify for free lunch from paying the transportation fee. But it’s still possible for some parents, like Finley, to not know they’re exempt from paying for bus fees and be sent to collections when they can’t pay. Amy Redding, a parent who lives in the Kearny Mesa area, said it’s well past time for the district to reconsider its transportation policies. The fact that some neighborhoods in San Diego are not walkable creates a legitimate safety concern for students whose parents can’t drive them to school, she said. Corrections: An earlier version of this story said some but not all students who qualify for free lunch qualify for free transportation. All students who qualify for free lunch qualify for free transportation. However, students who receive free lunch but attend schools to which the district does not provide transportation are not entitled to district-provided transportation. An earlier version of this story also misspelled Derek Finley.